How Many Defects Can Your System Tolerate? Are you a member of the 1%? I don't mean the economically elite; rather, the software engineering elite. Those who inject just about 11 bugs, in requirements gathering through coding, per thousand lines of code. The 99% do much worse, averaging about 120 bugs per KLOC. Segger sent me one of their emPower evaluation boards. This 99€ card is meant to show off the company's various software offerings (RTOS, middleware, stacks, etc.) and their debugging tools. I was interested in their SystemView tool, which is used to monitor all sorts of operations in embedded code. It's hard for a developer to know what's going on inside of an embedded system that may not have much in terms of a display. Traditionally we use debuggers, but those only give us a static view of what's going on. Trace capability captures real-time operations, but overwhelms with a fire hose of instruction-by-instruction information. In contrast, SystemView logs events -- task switches, API calls, etc. Competing tools exist: Express Logic's TraceX, Percepio's Tracealyzer and Micrium's uC/Trace are examples. Segger's SystemView is a free, stand-along application not bound to any RTOS. It comes with hooks for their own embOS RTOS and FreeRTOS, but the manual describes how to use it with any other operating system -- and in systems that don't use one. Versions are available for Windows, OS X and Linux. 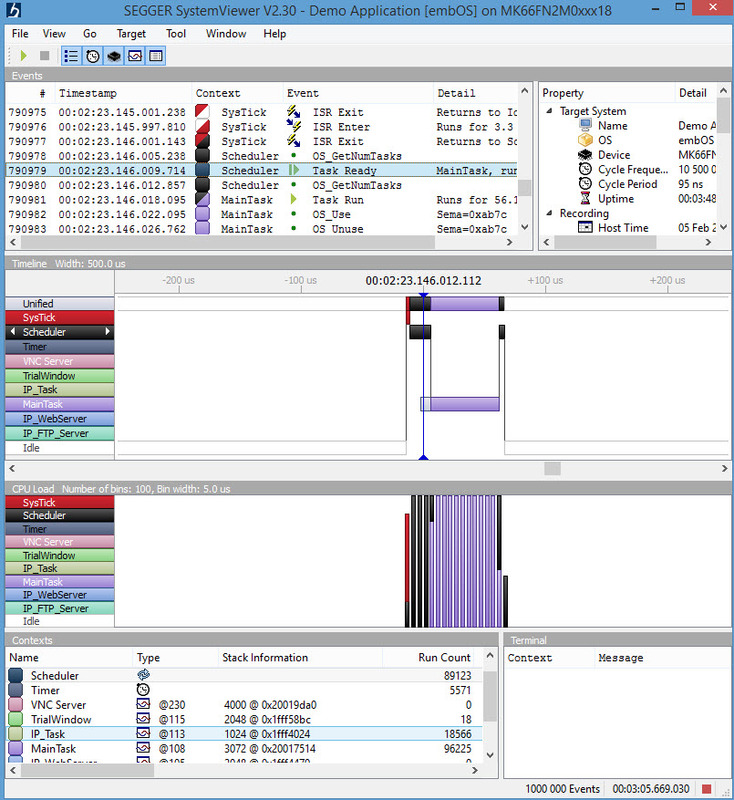 The middle ("timeline") window shows the system transitioning between tasks and states. The middle vertical blue bar is the cursor (just under the "4" in "00:02:23.146.012.112", which is over a black region that corresponds to the scheduler (task/context names and colors are on the left). It's also over the light gray bar associated with the main task. Looking at the top ("events") window we see that is marked "Task Ready MainTask." In other words, the MainTask goes ready at this time, though it isn't running. To the left of the cursor the red bar is the SysTick, which quickly invokes the scheduler. Soon the scheduler drops down to the blue MainTask that starts doing its thing. We're watching the RTOS multitask. The timeline's indicated time is in hours, minutes, seconds, ms, us and ns -- quite a bit of resolution indeed, though in practice that's limited by the MCU's clock rate. The APIs in the embedded system (RTOS and/or any bit of middleware) are instrumented to transmit data to the host computer when an event occurs. Those are all shown in the top "events" window, though you can selectively disable certain kinds of events from the display. So in essence the events window is the raw logged data and the timeline a translation of that into a graphical view of what happens when. Here the SysTick, which interrupts every millisecond, has occurred thousands of times and so looks like a solid red bar. Other tasks, like IP_Task, have been invoked as well. The window named "CPULoad" shows where the time is going. Some of the histogram's bars are solid blue -- that's where the blue MainTask was eating all of the CPU's time. These are organized as bins; you can select how wide each bin is. The bin at the cursor is black since the scheduler, which was assigned the color black, is running. The bar to the right of that is partially black and blue, since in that bin some execution time was spent in the scheduler and some in MainTask. The lower right window marked "terminal" displays printf-like data sent from the target code. Like all of these products SystemView relies on instrumented target code. The company's documentation claims the overhead is about 2kB of flash and under 1kB of RAM (though the acquisition buffer can be longer). And they also claim that on a 200 MHz Cortex real-time overhead is under one percent. The user's manual shows clearly how to instrument non-Segger (and non-FreeRTOS) operating systems and other middleware. It says the work should not take more than a few minutes; maybe I'm a slow learner, but this is a powerful and complex tool with a rich API. I'd figure on a couple of hours by the time you've read and understood the manual and have gotten things running. The product runs in one of two modes. If you're using one of their J-Link debugging probes (298€ and up), and the target is a Cortex-M or Renesas RX, it will collect data in real time forever. It's possible to lose data in the comm link if a ton of debugging information is being exchanged at the same time as SystemView is running, but that's easy to avoid. Alternatively, SystemView supports a USB connection from a host computer to the board without a J-Link probe. With that configuration one-shot data will be collected. On the demo supplied the buffer was just 1kB long, and after collecting one million events in 3 minutes 3 seconds the buffer filled and stopped acquisition. How did they fit so much data in so little memory? They didn't. The data was being uploaded as it was collected. Presumably, the upload slowly got increasingly behind till the memory was full. But that's an astounding upload rate. You can gate acquisitions via the SEGGER_SYSVIEW_Start() and SEGGER_SYSVIEW_Stop() calls to capture only narrow events of interest. The user's manual is here and is the best resource if you want more information.. I'm impressed. The tool is easy to use and very, very fast. The tabular and graphical views of the sequence of events is a huge time-saver when building multitasking systems. The tool's one shortcoming is a lack of a search for finding particular events in captured data. That's on Segger's to-do list. And I do wonder what the screen would look like if there were many dozens of tasks. A vertical scroll bar doesn't appear in the timeline window; each task gets smaller vertically to the point where it's hard to read names. They tell me a scroll bar is in the works, which is great, but it may be a nuisance to have to scroll vertically to see the task interaction. Highly recommended. And you can't beat the price (free). 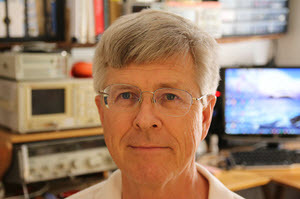 Mike Lillywhite is the lucky winner of last month's contest; he got a copy of Hardware/Firmware Interface Design. Reader feedback about these giveaways has been very positive. 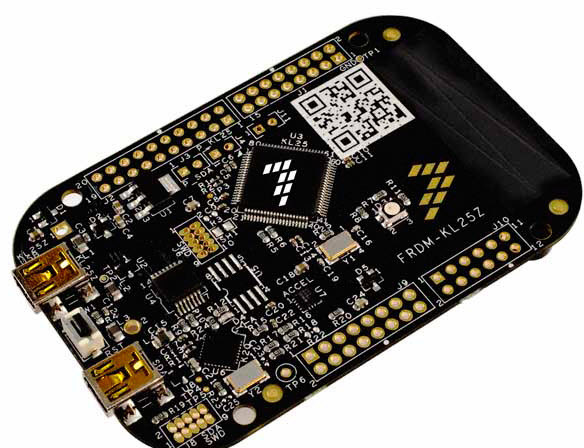 So this month I'm giving away a FRDM-KL25Z development board, which was kindly provided by Freescale. This board has a Cortex M0+ MCU. One neat feature is that it works with the mbed tool chain, which is a web-hosted C compiler. There's nothing to install. For small projects and experiments it's a really fast way to get started. The contest will close at the end of February, 2016. It's just a matter of filling out your email address. As always, that will be used only for the giveaway, and nothing else. Enter via this link. How good do you have to be at finding and removing software defects before shipping a product? A related question is, if you find X% of the bugs prior to shipping, what are the odds a system will fail in a given period of time? It's not easy to calculate this for a real-world project, but there is a lot of empirical data from which we can draw some conclusions. Well, maybe nothing as sound as a conclusion, but just as an impressionistic painting gives a fuzzy view of a subject, we can play with the numbers and get a sense of an answer. So the following is no attempt to be scientific; rather it's a thought experiment. Defect - an error in the program. For this discussion Defect doesn't include minor problems like a spelling error in a comment. But a spelling error on a displayed result is a Defect. Critical Defect - these are a subset of Defects, and are those that cause a system failure or an incorrect result. An example might be pumping 5 liters of morphine into a patient's arm rather than 5 ml, or a software crash. Defect removal efficiency (DRE) - the percentage of injected defects that were corrected prior to shipping. DREs span a wide range. You'd hope it was 100%, but for software in general it averages 85%. Embedded code averages 95%. Only 0.4% of projects exceed 99%. Virtually no one gets to 99.9% with exceptions like the space shuttle (at $1000/line of code) or projects coded in SPARK. In Applied Software Measurement (2008) Capers Jones found that 98.5% DRE is best-in-class for embedded projects. 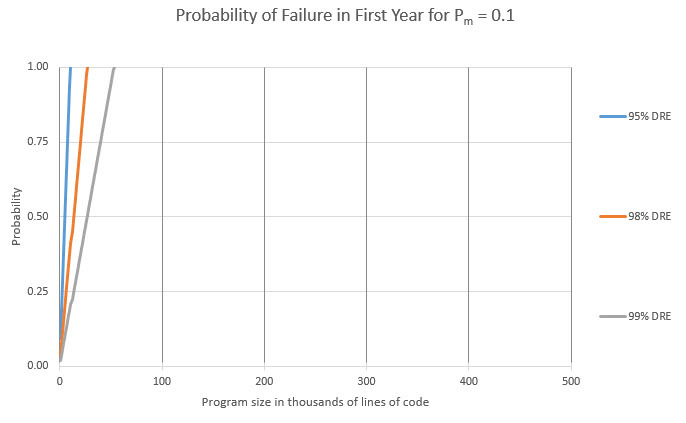 P is the probability the system will fail in the first year. Di is the number of defects that were injected per thousand lines of code (KLOC). How many will be injected? Capers Jones, in The Economics of Software Quality (2012), found the average project has 118 defects per KLOC prior to debug and test. This is the average for all software; he doesn't present data for embedded code. My firmware data shows this ranges from 50 to 100 defects/KLOC. For this discussion let's take the mean of those two numbers and assume 75 defects/KLOC. Dc is the fraction of defects that are critical defects. Jones pegs that at 0.25. S is the program size in KLOC. Pm is the probability that one of those critical defects will manifest itself in the first year. Obviously, different critical defects will have varying probabilities of appearing. I'm assuming that averages out to a constant, which probably yields a not-unreasonable guess. But Pm also has some other components that are hard to assess. A product being pounded on by thousands of users will increase Pm. That gets murkier if all or most of the customers all use the product in the same way, lightly exercising some possibly very error-prone features. Scary, huh? 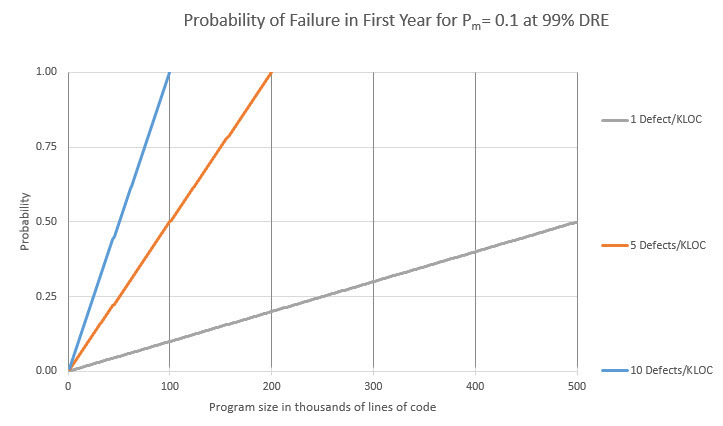 This chart shows that, absent extremely-good DREs, failure is inevitable as programs grow in size. The industry-average of 95% will doom bigger projects. Average firmware teams inject about 75 defects/KLOC, and ship about 4. 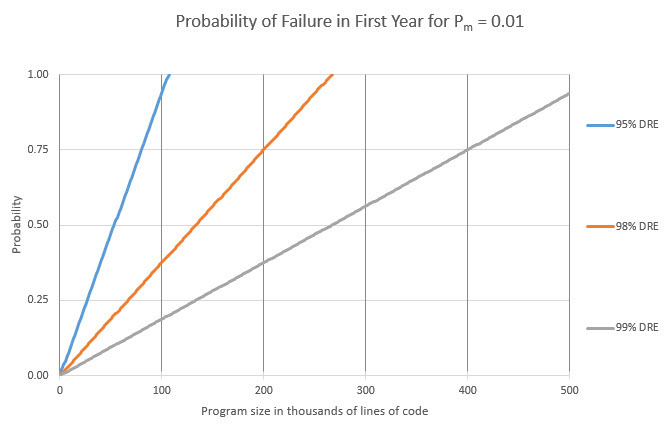 This graph shows that once a program gets big there is almost no tolerance for defects. Large programs must be more perfect, prior to debug and test, than average code is after the latter is tested and deemed ready to ship. There are a lot of caveats. A system can be designed to recover, perhaps via a watchdog, from a failure. Some systems recover so well the user never realizes a problem surfaced. A TV remote control could be designed so any button push restarts the MCU - it might crash, but the operator instinctively presses the button again and never realizes there was a problem. Those who have attended my seminars know I'm huge - or, as a current presidential aspirant would say, yuge! - on metrics. In software engineering the numbers are always shrouded in error bands, but they do paint pictures that give us important insights. Thanks to Scott Rosenthal for a heavy critique of the draft of this article and for cleaning up the graphs. In recent Muse (298) there are people talking on how to use the VMs to run old development software. I'd like to take it one step further. I personally couldn't imagine developing on a system other than Linux. I'm so used to the Linux workflow that it's very difficult to switch to Windows. The problem is that in embedded world most of the tools are Windows-centric. For me the solution was to run Windows 7 in QEMU + shared folder. In most of the cases, this "talk" is done over USB and most of the time VMs are pretty good at handling the virtual USB channels. But sometimes, USB dongles are using proprietary protocols and then the things don't work as expected. One such software is "RN52 Bluetooth DFU Utility" that didn't work when used from VirtualBox. After some (actually a lot) of digging I finally switched to QEMU and used its marvelous capability called PCI pass through. Basically, one of the physical USB controllers of my PC is assigned to the virtual machine, others are under the control of Linux. This way, the development software running in virtualized Windows machine can talk directly to the dongles/programmers and all is working well. USB controller is not the only device you can pass through to the VM, you can do it even with video card. The most important aspect here is that your PC's hardware has actually good support for this kind of thing. We are developing a game based on Ayn Rand’s "Atlas Shrugged". We are looking for objectivist-oriented programmers.